These two piece rigid boxes are a perfect way to package wine for any occasion. This size is perfect for a regular sized wine bottle. Minimum of 3 cases per order. 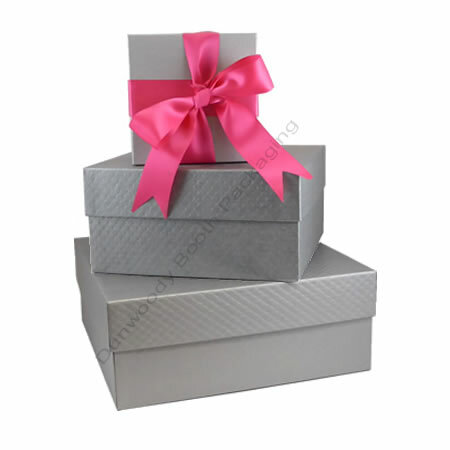 Measurements: 13" x 4" x 4"
Square Rigid Boxes - Silver Embossed - 5-1/8"x5-1/8"x4-1/2"
Square Rigid Boxes - Silver Embossed - 11-1/4"x11-1/4"x4-1/2"
Square Rigid Boxes - Silver Embossed - 12"x9"x2-1/2"
Square Rigid Boxes - Silver Embossed - 19"x12-3/4"x4-1/4"